Thousands of Ghanaian workers made good on their promise to hold demonstrations on July 24 against what they say is the deteriorating economic situation inside the West African state. Following the Republic Day actions on July 1 outside Flagstaff House, the Trade Union Congress (TUC) and other labor organizations took to the streets to protest against inflation and the inability of the National Democratic Congress (NDC) government headed by President John Mahama to address the worsening situation facing working people. Wearing red t-shirts, the workers blocked traffic and denounced the government’s neo-liberal policies that have resulted in an annual inflation rate of 15 percent. The workers called for the re-institution of subsidies for fuel in order to make petrol more affordable to motorists. The rate of inflation has resulted in a significant deprecation of the cedi, the national currency. Prices have skyrocketed along with taxes causing an at least 50 percent increase in the cost of living. These demonstrations come at a time when Ghana is being praised for what western analysts say is phenomenal economic growth. The country is now an oil-producer yet most people have not seen an improvement in their living conditions. Workers converged at the Obra Spot near Kwame Nkrumah Circle in the capital of Accra despite efforts by the police to dissuade them. The police made a tactical decision to hold back and consequently averted a possible violent clash between trade unionists and the authorities. Demonstrations and other protest actions also took place in Ho, Kumasi and Cape Coast. In Tema, workers protested as well against the inflationary spiral plaguing the country. Earlier in the week, the Railway Workers Union (RWU) threatened to strike over the poor conditions under which they are toiling. A sit-down protest by the RWU hampered routes between Tema and Accra. During the demonstrations the Minister of Labor and Employment for the NDC government, Haruna Iddrisu, attempted to talk to the crowd. He was met by further chanting and derisive language. A four-page petition was submitted to Iddrisu calling upon the government to take immediate action on the subsidies and other measures to stabilize the economy. Although the labor minister sought to convince the workers of the government’s good intentions, they would not agree to end their protests. How Far Will the Workers Go? 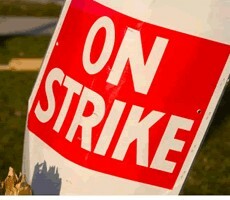 Some analysts observing the situation in Ghana say that the current labor actions could lead to broader social unrest. After being told of the purported economic achievements of the country, workers are demanding that there be fundamental changes to place emphasis on infrastructural improvements and the betterment of the social conditions of the people. Judging from the history of the working class in Ghana, formerly the Gold Coast, they have played a pivotal role since the post-World War II period. The February 28, 1948 rebellion involved both the ex-servicemen demanding adequate compensation for their tenure under British imperialism during the war and the economic boycott initiated by Ga traditional leaders protesting the cost of colonial products. The five day rebellion of 1948 thrust Kwame Nkrumah into the forefront of the national liberation movement. In 1949, Nkrumah and his Committee on Youth Organizaiton (CYO) broke with the more moderate United Gold Coast Convention (UGCC), demanding self-government now. Although Nkrumah was imprisoned after the general strike which was eventually broken by the colonial authorities, the impact of the actions led to the ascendancy of the CPP in the British reform elections of February 1951, prompting the release of Nkrumah and the formation of a coalition government with the British who eventually relinquished colonial control on March 6, 1957. Under the CPP government during the 1951-1966 transitional and independence period, Ghana became the leading anti-colonial state in Africa. The political example set by the Ghana Revolution laid the groundwork for other national liberation struggles throughout the continent and the African Diaspora. The Nkrumah government was stifled in its national development “program for work and happiness” by the world decline in cocoa prices during the early and mid-1960s, coupled with internal divisions within the CPP and outside agitation by right-wing opposition parties. The CPP was overthrown on Feb. 24, 1966 by sections of the military and police engineered by the United States Central Intelligence Agency (CIA) and the State Department opposed to Nkrumah’s revolutionary Pan-Africanist and socialist policies. Today Ghana remains trapped by the neo-colonial phase of world imperialism which Nkrumah identified during the last phase of his leadership in the 1960s. In addition to its militancy, Ghanaian workers must advance a program which addresses the social conditions at their root. Africa cannot truly develop under the existing system of world capitalism, neo-colonialism and imperialism. The ideological and political struggle between exploitative systems and socialism can only be resolved through a fundamental change in the relationships between the western imperialist states still dominant in the global system and the aspirations of the majority of workers, farmers and youth in Africa and indeed throughout the world.